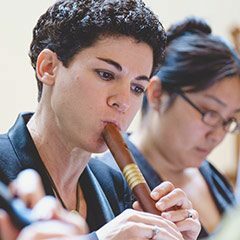 Rotem Gilbert is a native of Haifa, Israel and a founding member of Ciaramella, an ensemble specializing in music of the 15th and 16th centuries. Ciaramella has performed throughout the United States, in Belgium, Germany, and Israel, and released a CD on the Naxos Label, and two recordings with Yarlung Records. Their recent CD, “Dances on Movable Ground” has earned 5 stars by the British magazine Early Music Today and was picked as Editor’s Choice, lauded for its “expressive fluidity and rhythmic vitality.” She was a member of Piffaro (1996-2007), and has appeared with many early music ensembles in the United States and in Europe. After studies on recorder at Mannes College of Music, she earned her solo diploma from the Scuola Civica di Musica of Milan where she studied with Pedro Memelsdorff. She earned her doctorate in Early Music performance practice at Case Western Reserve University. She teaches musicology and Early Music courses at USC Thornton School of Music. Rotem received the 2012 Dean’s Award for Excellence in Teaching at USC and is the joint recipient (with Adam Gilbert) of Early Music America’s 2014 Thomas Binkley Award for “outstanding achievement in performance and scholarship by the director of a university or college early music ensemble.” Rotem can be heard on the Deutsche Grammophon’s Archiv, Passacaille, Musica Americana, Dorian, Naxos and Yarlung labels.